What Kind of Bicycle Do I Need? Our rides are designed to be do-able on almost any well maintained bike. The Fitness Rides will be mostly on road, although we ride dirt / gravel roads, and we recommend either a sturdy road bike or a hybrid bike. A mountain bike will work, but you will need to work extra hard to keep up. The Recreation Rides combine on road and some civilized off road. A sturdy road bike will work, but you will generally be happier with a hybrid bike. You will get a better workout on a mountain bike, but we never go that far off road. Will this ride be hard and long enough for me? AdventuRides Fitness rides typically cover twenty five to thirty miles of roads and civilized off road in about three hours, with some climbing and descending. They are moderately paced, not races, but the uneven terrain can be challenging and tiring. Will this ride be too hard and long for me? AdventuRides Recreation rides are more leisurely paced and we try to accommodate the desires and capabilities of the group. If I can’t keep up, should I turn around and go back? No. Rides are designed to be comfortable for just about everyone. If however, you find the speed too demanding, we don’t recommend giving up and turning back. We never leave anyone behind: we feel responsible for returning you safely to the starting point and will make an on-the-trail accommodations to assure this happens. If you insist on leaving the group, we will either detach someone to return with you, provide a map, or issue verbal instructions. May I bring a child? No. Our routes are not conducive to child carriers or tag-a-longs. Do you ride in the rain? No, if there is heavy rain we will reschedule the ride to the end of the session. Wear (or bring in a rucksack) several layers of clothing which can be added, removed, or adjusted as the ride proceeds. We swear by shirts with zippers. A waterproof, wind blocking jacket is a must. You must wear a helmet and may appreciate an ear covering if it is chilly. You will need gloves. A lightweight glove and maybe a glove liner will help in cold weather. Disposable hand warmers available in many sporting goods stores work well if you have a cold-hand problem We also recommend long underwear or fleece-lined tights with wind blocking features. Of course, all of this depends on the temperature and wind velocity. We strongly recommend bicycling shorts with a padded crotch liner. Your body will thank you. By May and certainly June shorts and light shirts will do. No, but your bicycle must be in good working order and you need a spare tube which fits your wheel, tire irons, and a frame pump. How will I know where the starting point will be? We will e-mail you directions each week. Rides usually start from a location no more than a half hours drive from Groton, Massachusetts. Do you cancel because of cold weather? No and Yes. 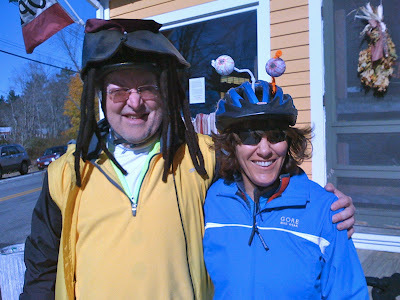 It is possible to dress properly for an enjoyable ride even in New England. However, we have been known to cancel in cold, cloudy, and windy conditions. Bill Brandt is a escapee from the world of high tech. He owns several non traditional bikes, including one that fits in the tiny trunk of his sports car. Bill is currently designing non-traditional custom bicycles for baby-boomers. He has been leading AdventuRides since 2004 and is practicing to be a ski bum during the Winter. Carole Greenfield has been riding with friends and groups for over 20 years. She enjoyed twelve wonderful sessions of cycling adventures through Littleton and Acton Recreation Departments and wants the tradition to continue. She wants to share her enthusiasm for exercise, fresh air and scenery with others. Join Us each week as we bicycle the scenic backroads of the Nashoba Valley and surrounding areas in Central Massachusetts and Southern New Hampshire. We offer three different types of rides. The Recreation Ride is typically all on-road, although we will mix in some civilized off-road on occasion. We start out riding 10 to 12 miles in 2 hours with plenty of time for sightseeing. Almost anybody with bicycling experience will enjoy the Recreation Rides. The Fitness Ride mixes on-road and enough off-road riding to keep things interesting. We start out riding 15 miles and go farther and faster as the season progresses. The Exploration Ride is an all day adventure that covers 25 to 30 miles and we usually stop for lunch in the middle. Check us out at AdventuRides.com. This is actually a test. If the first word of the Title is "GO" then the Title is colored GREEN. This is actually a test too. If the first word of the Title is "STOP" then the Title is colored RED.